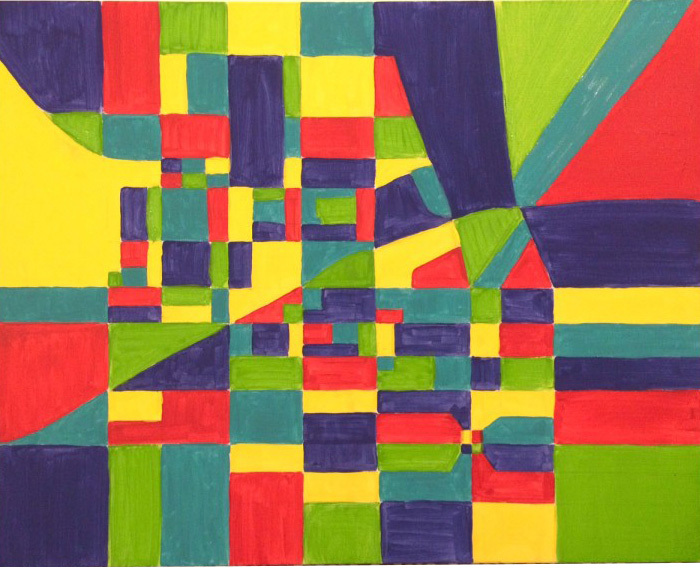 This abstract map of Carlisle, created to beautify Hope Station's Kids' Cafe, places the cafe at the town's center. The purpose: to highlight the perspective of the underserved. How do social-justice issues manifest in the lives and minds of African Americans? This spring, students in Associate Professor of Africana Studies Lynn Johnson's course took that question out of the classroom and into the community when they partnered with local nonprofits that help improve the lives of underserved people in Carlisle. The students published their findings in a class blog, Social Justice in the African American Imagination. Mergitu Yadeto ’18 (chemistry) and Bria Antoine ’16 (mathematics, economics) helped local women build resumes through the Carlisle YWCA’s Gather the Women program. Janaiya Banks ’19 (Africana studies) and Paul-Anne Robb ’17 (sociology) interviewed two ex-offenders and compiled a directory of businesses for post-incarceration job seekers in Carlisle, a project also led by the YWCA. Jahmel Martin ’16 (American studies) and Kennedy Lewis ’19 (Africana studies) worked with the YWCA to develop a youth leadership conference on white privilege. Scheduled for next fall, the conference will bring together more than 100 Cumberland County high-schoolers to discuss and learn about the effects of racism and privilege in their own lives. Sofina Odero ’18 (Africana studies), Legacy Watkins ’18 (mathematics, Africana studies) and Elijah Wright ’19 (undeclared) studied issues surrounding access to fresh, healthy food while evaluating Hope Station’s Kids’ Café program, which provides after-school snacks to more than 100 low-income schoolchildren. Africana studies majors Quadrese Glass ’19, Teryon Lowery ’19 and Karl Lyn ’18 (also educational studies) partnered with Carlisle Victory Circle (CVC) to address the growing dropout rate among male students of color at Carlisle High School. They developed Men Overcoming Obstacles, an after-school program that will operate as a branch of the CVC, providing targeted workshops, a computer lab and internet access, community-service opportunities and tutoring and mentoring experiences to at-risk male youth. Lowery will stay in Carlisle this summer to continue to develop the program with Sonya Browne, YWCA's mission impact director and co-founder of the CVC. Lyn, Odero and Lewis also helped educate voters during a voter-registration drive that was part of Hope Station’s Feb. 27 Black History Festival. Brandi Hunter ’17 and Emoni Anderson ’18, both Africana studies majors, worked with Hope Station to research archival photos of historically black schools and churches. Christian Moton ’20 (undeclared) and Africana studies majors Markiah Baker ’19 and Naji Thompson ’19 also dove into the Cumberland County Historical Society archives. They researched families connected to Carlisle’s Memorial Park, once the site of an African-American cemetery. Gregory Boles ’16 (economics) and Samatha Miller ’18 (law & policy, Africana studies) organized and led a spoken-word workshop for 25 middle- and high-schoolers in the YWCA Girlpower program. Shannon Zangas ’16 (political science), Asazina Cooper ’18 (women’s & gender studies, Africana studies) and Jena Brooker ’19 (environmental studies) incorporated social-justice and sustainability lessons into badge activities for middle-school Girl Scouts. Samantha Mendoza-Ferguson ’17 (international studies, French & Francophone studies, art & art history), Manny Ocampo ’18 (Africana studies) and Emily Katz ’16 (sociology, policy management) created paintings for Hope Station’s Homework Club area, teen lounge and Kids’ Café. “We wanted to foster a deeper sense of community ownership over the space so that people who use the services at Hope Station feel more connected to and proud of their community,” said Katz, who developed an abstracted map of Carlisle that places Hope Station at its center, acknowledging the perspectives of those who rely on the nonprofit's services.